Well, today was paint day, finally. Am I done yet? I don't know. I can't tell for sure until it dries, but it looks like it needs a second coat. The finish looks uneven and I can see where all the filler was used. 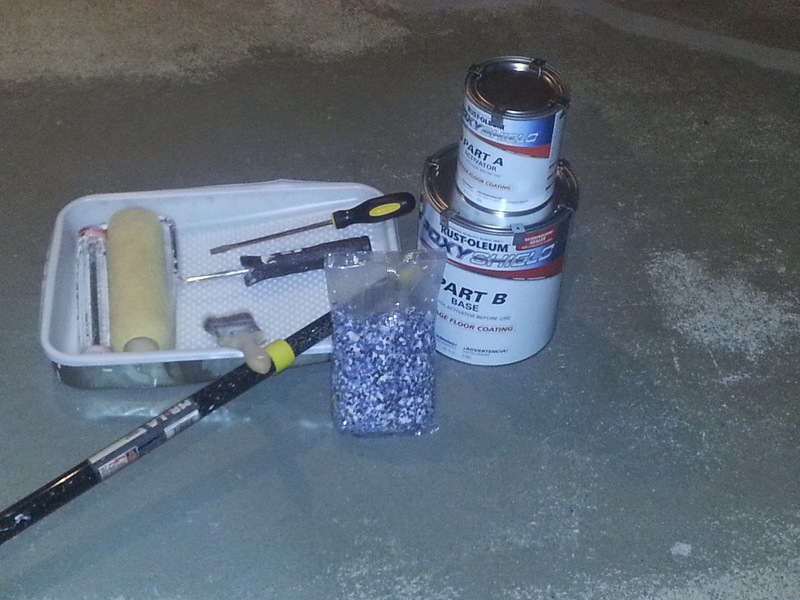 The instructions for the regular garage flooring doesn't talk about a second coat, but the professional one does. I'll be calling their 800# in the morning to see. 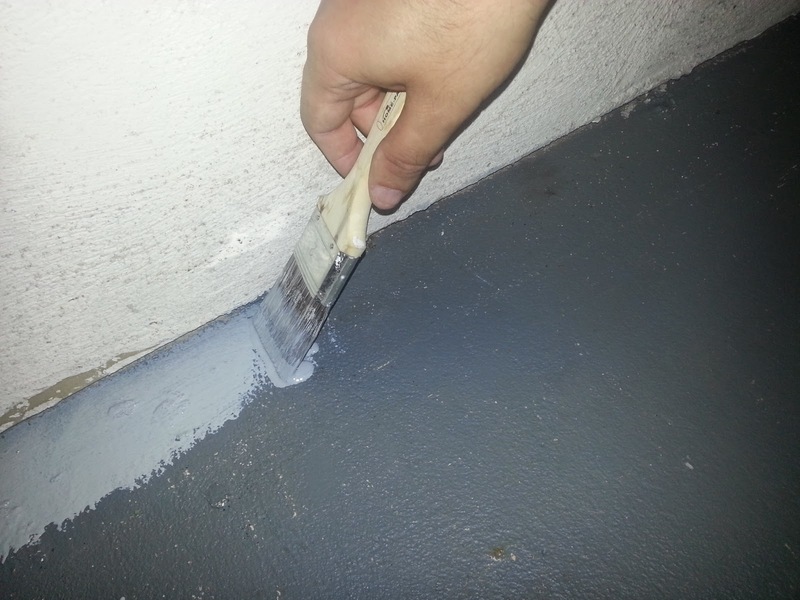 If it needs a second coat, it looks like one needs to do it quickly and not wait too long. Otherwise, you have to go through the whole cleaning process again. My tools for the day included a 2" paint brush, a roller, nap, and pole, along with a screwdriver to help open the cans. The chips do not get mixed into the cans but do get thrown on top of the completed floor sections. 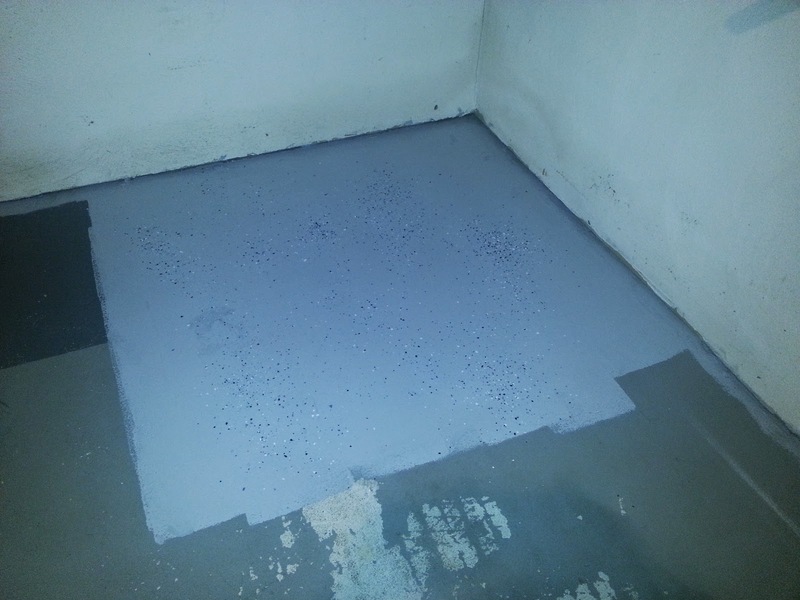 To activate the floor coating, you mix in the activator. Then wait before you can use it. How long depends upon the temperature outside. I'm not sure if I waited long enough here. I think I did, but temperature outside was not temperature in the garage so perhaps I didn't wait long enough as it was hotter outside. The hotter the temperature, the less the wait. After waiting the necessary time, you cut in around the edges of the floor. The whole floor. The instructions suggest one person cut in while another rolls the paint. I did all the cutting in before rolling. You paint the floor in four foot square sections at a time. 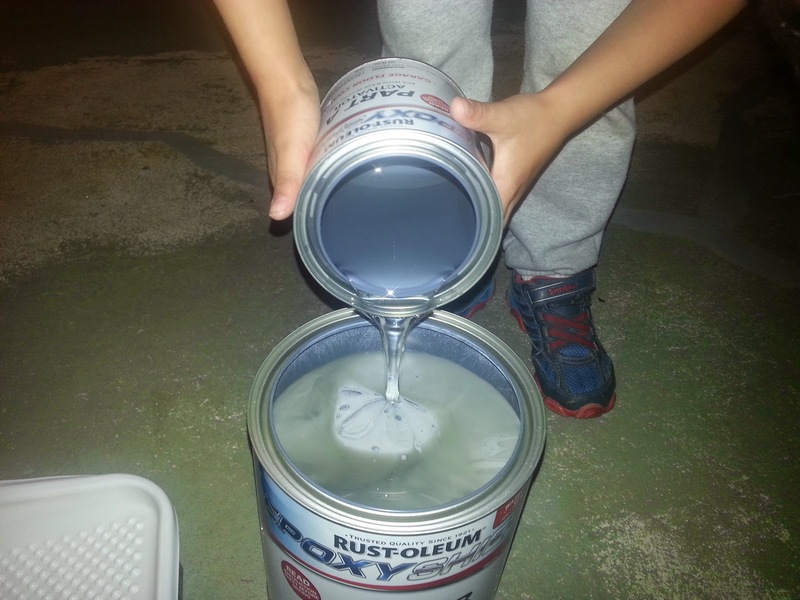 That isn't large, but it allows you to easily throw the paint chips on top for the coloring. Here is where I had help. As a rolled, my wife threw the chips on each section. She really enjoyed this part. At first, she thought I was putting on too much, as I did the first section, but then she realized the bag was only for half the floor. The first box covered up just about half the garage floor. The second box allowed me to finish the rest. Remember not to paint yourself into a corner, but otherwise, each side took about an hour of paint time. With any leftover material, you just let it sit out and it hardens, so more easy to dispose of then left over paint. This means make sure you clean up your tools, too, as it won't be easy to get the material off them if any made its way on. As I said in the first paragraph, I'm not sure if I'm done yet. I think not, as it appears to need a second coat. We'll find out tomorrow. I'm saving the completed picture until I'm really completed for sure and its dried. You will have a nice floor when all is said and done. Durable too. 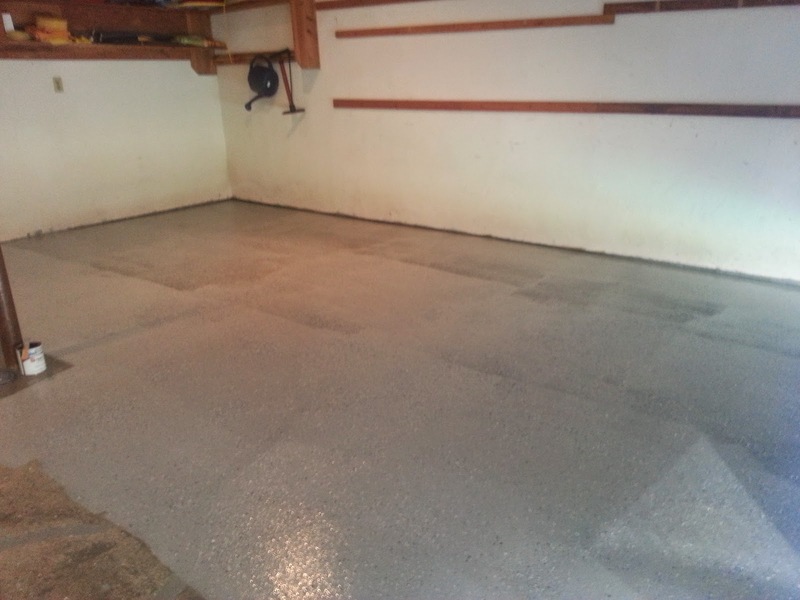 My husband did epoxy floors commercially for years, they last for decades if done right. Though a lot of work to get there.